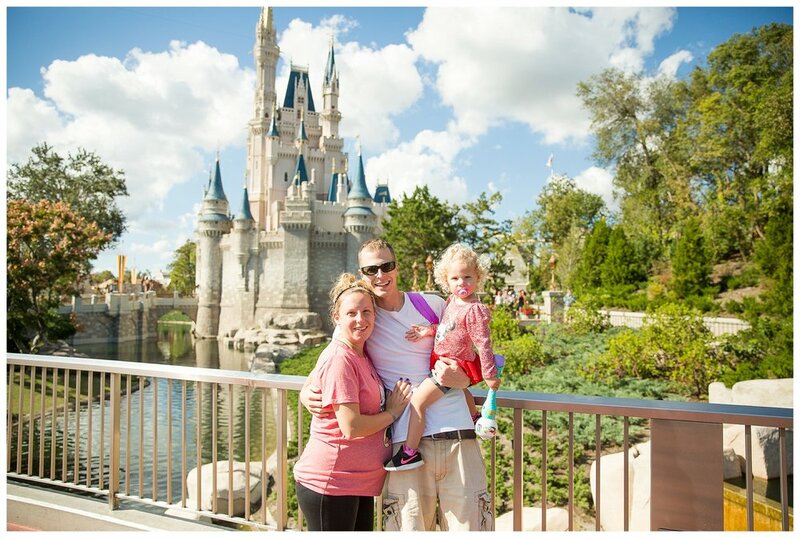 We took our first family trip to Disney World with Callie (age 2.4) and I wanted to share some tips for making it an enjoyable experience for everyone involved! If you have never been to Disney World it can be quite overwhelming if you don’t plan and think ahead. There are 4 parks, they are each a decent size, and everything is spread out.. so it’s nice to know some things ahead of time. First things first.. don’t expect to spend all day at the parks with little ones! Since Callie still naps we would go for a couple hours in the morning and then a couple in the evening. This helped prevented massive melt downs and over exhaustion. We kept her out late a couple nights and that did end up catching up to her.. that girl needs her sleep! So just beware! 1) If you use Disney’s complimentary transportation expect to wait for it and add an hour of travel time total to your trip. You will be waiting for buses, trams, boats, ect. so that is time your little one will have to be patient and wait. 2) Get fast passes! Download the Disney app and you can manage all of your fast passes on there. You can have 3 planned for one day ahead of time (all have the be at the same park) and then you can add more as you use them. Disney is always crowded so if you want your toddler to actually be able to ride things without having to wait 30 minutes each time (impossible for young ones to do over and over) then you need them. You can also see wait times for rides on the app as well. 3) Bring your own snacks! You can bring food into the parks so snacks are good for lines and save you money. 4) Prepare to walk and carry toddlers! That’s why it’s good to only do a couple hours at a time and wear appropriate walking shoes and attire! 5) Bippity Boppity Boutique is a must! That was our favorite part of the trip. It is located at Disney Springs which is a neat place to walk around, shop, and eat. They also have a little train ride and carousel at Disney Springs so you can totally make this a 3 hour trip. We went with the basic package ($70) which was hair, make-up, and nails and we brought our own dress and shoes. They also gave Callie a backpack and sent her home with all her make-up and nail things. The next package up ($120) includes the dress and shoes but we didn’t think that was worth an extra $50. Callie was so cute sitting being pampered and she looked adorable at the end of it! I love the pictures I took there. Her experience was about 45 minutes and worth every penny. 6) We did a character breakfast and the food was really good and they had 3 characters come around, but it was too expensive in my opinion. Callie doesn’t like to interact with the characters so that kind of defeated the whole purpose. You can get a fast pass to meet the characters at the parks, which is a better use of money in our opinion. 1) Magic Kingdom: This park has the most things to do for little ones. Dumbo, The Barnstormer, The Magic Carpets, Buzz Lightyear’s Space Ranger Spin, and The Little Mermaid are the hit rides for sure. Callie also enjoyed Monsters, Inc Laugh Floor and Mickey’s Philhar Magic, which are more like shows. They also do random performances in front of the castle that are cute and the parades are always a hit. Those times can be found on the app so you can plan for those. The fireworks show is impressive but again.. it’s crowded so don’t expect to have a front row seat and prepare to fight crowds getting out! Overall, you will get the most bang for your buck at this park. 2) Hollywood Studios: The Frozen Show was a let down. It was basically two characters narrating the entire story of Frozen and then they played scenes from the movie on the big screen with the words for people to sing along to. Anna was only in the very beginning, Kristof made a small appearance, and Elsa came out at the end. She didn’t even sing let it go! Come on that’s every toddler’s dream! At the end the characters sang Christmas songs that the kids didn’t know. Oh well! Voyage of the Little Mermaid was cute and Callie loved Disney Junior Live on Stage! We did Fantasmic one night but it didn’t really keep Callie’s attention and also it was a little scary for littles. Seeing scenes displayed on water is cool for older ones, but the littles don’t really get it. Callie just kept wondering where Mickey was. They also have a Muppet Show and a Toy Story show but we didn’t catch those. No rides for littles here.. just shows. 3) Epcot & Animal Kingdom: We skipped these parks since I didn’t see anything Callie would really love here. If we went to Animal Kingdom, we would have done the safari ride and a little spinning dinosaur ride, but that’s about it. Since Callie was only 36 inches, she was a little limited. Also, we heard It’s a Bug Life was too scary for littles. We would have checked out the Memo ride at Epcot, but passed on the Frozen ride since we heard that wasn’t too good either. We didn’t feel it was worth the trip to these parks for Callie. We just did Magic Kingdom and Hollywood Studios twice! We also took advantage of our resort! They had a bunch of pools and slides for Callie that she enjoyed. So long story short.. PLAN ahead and lower your expectations and you and your toddler will love it! When Callie and I were waiting in line to get some popcorn a lady pushing a merchandise cart just thought Callie was the sweetest thing and handed her a Little Mermaid bubble wand for free! Callie loved it and played with it a lot and that’s the magic that can be found at Disney. The staff is generally super friendly and they want to make it a great experience for everyone. The characters are so animated and interactive with the kids and it’s so fun to see! We are still Disney fans and can’t wait to return with our two daughters when they are older!